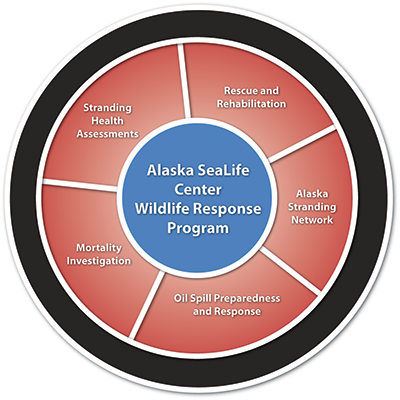 The ASLC Wildlife Response program responds to live and dead marine wildlife that has been abandoned, stranded, or injured throughout Alaska. The ASLC is the only institution authorized to rehabilitate live stranded marine mammals in the state. We operate under permits and agreements issued by the National Oceanic and Atmospheric Administration (NOAA) and US Fish & Wildlife Service (USFWS). ASLC plays a critical role in responding to oil spills or other unusual events. In addition to covering the live animal response and care during the ‘busy’ season, May to September, ASLC remains in a ready state year round to provide basic animal care for oil-affected animals and deploy a mobile treatment and rehabilitation enclosure.